Cat men and ladies , this is YOUR book!For the love of fur balls that taught me how to love. I loved the first book Under the Paw: Confessions of a Cat Man it was hilarious and heart-warming to read, at the same time I also found myself agreeing with certain things the author was saying about his cats when thinking of my own cat.However this book seemed to have lost it's way a bit, there was humour, but there was something lacking, it felt less about the cats and owners and more about the owner and the life he has outside his bubble of cats. It could have been me though thinking that, but I love the personalities that Ralph, The Bear, Janet, Bootsie and Pablo brought to the book, what we learn about them and then suddenly we are taken away from the cats to look at a new angle of horse riding? It wasn't even a little story, a little humour tale, but it was a full chapter's worth about horse riding.My way of thinking about it, is the author was using the space to write about his relationship with his wife Dee, but in doing so he was making the book an autobiography of himself and at times not with the cats that were the focus and whole point of the book.There was a few sad moments in there, one about Janet and another about a neighbour.This book could have done better, though it did still have the humour of the last book, it wasn't as funny, however I will see what the latest book The Good, The Bad and The Furry: Life with the World's Most Melancholy Cat and Other Whiskery Friends is like, I have higher hopes for it. This was another highly enjoyable memoir about his life 'under the paw' from Tom Cox. As the title and synopsis indicates in this second book he ventures out to experience other animals besides cats.His insights are so spot on. Like me he has a cat with over-active thyroid so knows the struggle for getting the daily pills into cat and the chapter outlining the steps for this had me weeping with laughter. A delightful memoir even though there are a few sad bits as is inevitable in this kind of memoir. Sweet and poignant, especially due to Janet, but a little more disjointed and less cat oriented than the previous novel. A 3.5 really, it was a bit of a strange book at first as it appeared to ramble all over the place, however, once I got used to the style I enjoyed it a lot.It's a mostly funny read, with some sad moments and fun observations about mostly cats, but also relationships with others (friends, family etc.) and the occasional perils of work! The author is the guy behind 'MY SAD CAT', which has been funny to follow in my Facebook feed.It both reminded me of how much I would like a cat, but also of how much chaos they can create... perhaps a good thing to be reminded of since I cannot get a cat yet!I will be looking out for other books he's written, as I want to read more. This book made me want more cats. All the cats! But most importantly it reassured me that I’m not totally deranged for committing so much time and money to my elderly, diabetic, irritably-boweled mess-machine. It's strange reading an autobiographical book when you have knowledge of what comes later, but it didn't detract from this amusingly written selection of recollections. With long chapters detailing particular events, some funny, some sad and short bits to dip into there is much to enjoy.The stories about Tom's parents and childhood really appeals to me, but it is the cats he writes about with such affection that I love most. Writing about felines without being twee is an accomplishment in itself and Tom's style is very easy to get on with. A pleasure. This is THE book for any animal lover! It's cute, it's funny and even bittersweet at parts, but the love the author feels for his six (yes, SIX) cats is truly heartwarming. We follow him through cat-fights, hairballs, dog walks and hilarious family members; also coming across tigers, sheep, bats and human animals.There are ups and downs and happiness interspersed with sorrow, and even if some parts seem a bit flat or over the top, his wry, wacky and witty humour shines genuinely through. I found myself wishing the book would have been longer because as a cat owner myself and having gone through what the author has, I know that not even twelve books that size could possibly contain all the adventures and misadventures he writes about. What made the book enjoyable is the varied chapters and diary excerpts (and puns in the titles) because not even one was boring or slow. Oh, and I mustn't forget the cat language dictionary. I assure you-this is the only place where you can find cat swear words or names for the fur they leave around the house!I also loved the way he sees his cats as persons-holding dialogues and arguments with them, making them perfect human characters, only a little hairier. Even those who may profess themselves as cat haters will find this an endearing read. Next on my to-read list? Tom Cox's first book-Under the Paw!!! This is the kind of book any cat lover and owner can relate to. If you've owned multiple cats, then you know how unique and individual each one is. Tom Cox describes each of his in such a funny light that I found myself laughing (with them, not at them, the last thing you'll ever do is laugh AT a cat) It's just a really great book! I love the way he writes, and I love his sense of humor. I love the cats, and now I'm going to go out and somehow find a copy of his first book this one was just that good. So highly recommend I can't even put it into words, and a definite five star book! I didn't enjoy this as much as Under the Paw; it was more disjointed, reading more like a collection of columns. But that's still quite a lot of enjoyment, and I loved being reunited with Cox's feline family. Sentimental, touching, hilarious, gross and above all real tales from the cat-owning battlefield. amusing, well written book, although not as much about cats as the first in the series, very enjoyable and laugh out loud funny. I like how the style of writing changes like how some of it is written from the cats point of view. Would recommend, even to people who aren't huge cat fans. This book will be loved by anyone who has, or has had, cats in their life. Not the whole book is about cats, but the other tales don't feel out of place. It's written in a friendly, candid, and often humourous way. It's a comfortable book to read, like a conversation with an old friend. Another amusing, delightful book on Tom Cox's companions of the furry variety but this time he widens his subject to include others. the sections on his father and his exploits in Kenya are especially amusing. Another enjoyable, light holiday read. Tom regards his cats as individuals with personalities and quirks of their own. The author begins this book with six cats and a wife. The book ends with less of each but it never feels sad or depressing. Cox writes with a dry wry humor, similar to other British authors I adore. Some truly laugh out loud bits in this book - while the relationship side is dealt with through the cats. A few bits I didn't like, but on the whole it was great. I have not read Cox's previous cat book (called Under the Paw), so at first it was difficult to learn which cat is which colour (I e.g. thought The Bear was a tabby, but finally it was revealed that he was black). Nevertheless, the book is funny and entertaining enough, although Cox's complex writing style made it a little bit hard to follow.My favourite part was this (about a friend's fat cat called Samson): In the time since then, Daniel has kept me up to date on [Samson's] progress. Though he has lost more weight, he's still big enough to be seen from space. That is to say: when Daniel logged onto Google Earth to look at the picture of his house, he noticed a large ginger spillage in the corner of the driveway clearly visible as Samson. Second instalment of Toms adventures with his cats, and we start to glean a little more about Tom himself as he opens up into his writing. It's still a book about cats, but it's also about self discovery and how he starts to find himself more through his writing. Not quite the finished product but close. Cox's style has developed since his 1st 'cat book.' There's a more confident prose style and a more coherent theme throughout. I continue to love the language Cox uses, the one part conversational, one party dreamy voice that is throughout. In particular, I very much enjoyed the way that each section beads a narrative that is note continuous but, rather, wonders back and forth along a timeline that traces the shape of Cox's thoughts, moving around a difficult time, coming in to it, retreating, returning, almost as if the words themselves are summoning in to being Cox's development and adjustment to his changing life. There's something refreshing experimental to a structure, and almost lived-in, where we switch from day to day anecdotes, to wry musings, to asides that are heart-wrenching in their subtlety. Talk To The Tail by Tom Cox is an absolute gem of a book for any cat lover. This was my second cat book by Tom Cox and I enjoyed it just as much as the first.Tom Cox has the gift of capturing exactly what life is like with six cats. As the owner of five (it used to be six) cats myself, I find myself in agreement with Tom on so many things in his book. Like Tom, I can recognise the difference meanings of miaow's. Our late cat Ben's "look what I have caught" miaow is very different to Marble's "help I'm going to be sick" miaow. Tom has certainly captured the essence of life with cats.As every cat person knows, no two cats are the same. It was an absolute pleasure to read about the different personalities of Janet, Pablo, The Bear, Shipley, Ralph and Bootsy. One of my favourite descriptions was that of Shipley, "I live entirely in the moment and think exclusively about my own needs on a minute-by-minute basis". Love it! What a classic.Owning cats unites cat lovers. It does not matter how old you are. Tom writes of a wonderful bond he had with his octogenarian neighbour and her cat. I love Tom Cox's style of writing. He writes what he observes but brings humour in the telling. There were moments when I laughed out loud. There were also moments when I shed a tear. Tom Cox has perfectly captured life with a multi cat household. 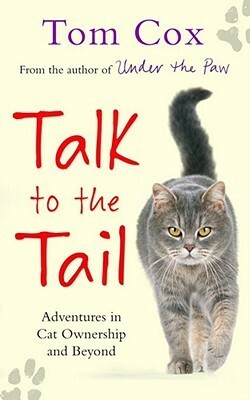 Talk To The Tail is an absolute 'must read' for any cat lover. I certainly cannot get enough of Tom's books and shall definitely be tracking down more of his books. I am just glad he's written loads!! I read and loved Tom Cox's first book and I follow him on facebook, especially enjoying his surreal 'sad cat' photos of The Bear so I was no stranger to his humour. Sadly, I found that Talk to the Tail was the book equivalent of getting stuck on a long journey with that person who bangs on far too much about just how fascinating their child or cat is. I actually spent several evenings last week with such a person and came away vowing to shut up about my cats in future.The thing about cats and kids is that they are endlessly fascinating to their specific humans but not of much interest to the rest of the global population who don't happen to know that cat or kid. Somehow Cox got away with it in this first book but this time around it just wasn't working for me. The book was very rambling and disjointed and felt like it had been rushed. There was no linear path through the book and a lot of side-trips to what read like "Here's something clever I wrote for a magazine or newspaper that I've shoved in to fill the space". Clearly he was distressed at the breakdown of his marriage but I'm not keen on paying to listen to a chap blather on about whatever takes is fancy about dogs and sheep and non-cat stories. While not as cohesive in narrative as Under the Paw, this is still a funny and heartwarming book for animal lovers. It is clear that the tone and focus of the book changes midway due to events that occurred during its writing. What is initially a collection of short stories of Tom's history with various animals soon becomes a bittersweet recounting of his split from his wife Dee, and the emotional aftermath - especially where the cats are concerned. These parts, particularly the end, are all the more poignant for how understated Tom's narration is.I really enjoyed the book more when it was raw and honest like this, but it was still great at the earlier parts - the chapter focusing on Tom's dad was a special delight. Overall, a most enjoyable and cheering read. The second of Cox's cat-memoir books continues much as the first ('Under the Paw'), with more quirky stories of the adventures of a man and his six cats. This one does branch out into non-cat-related anecdotes involving his general countryside life. These parts were still well-written but I didn't find them as good as the feline content. It was good, though, to get more of a look into his life in general, and some of the more negative life events are told with an open honesty that's endearing and compelling.I've got the next two of his books on my shelf waiting to be read, so I'm looking forward to getting my teeth into them next year. I love Tom Cox's writing, he has such a good sense of humour. I really liked the way he understated a lot of the more emotional parts of the novel, making the events all the more poignant. What let this book down a little for me were some of the chapters that departed from the subject of his cats almost entirely, and I found them a little dry. Saying that however, i'm still very excited to read the latest in the series. I've been having a really lazy month, and have been reading a lot of undemanding books - of which this is definitely one. But I'm getting tired of it now - time to jump back into some proper literature.This was mildly amusing, but not enough about his cats, which is presumably what people (including me) want. Some sweet moments and I can always enjoy reading about quirky cat behaviour but as a novel or auto-biography or memoir it's got a dreadful, rambling structure and I lost interest at a few points...even shipping some parts as they just seemed irrelevant. Under The Paw had more focus and Good, Bad, Furry has the draw of focusing on The Bear, who is a true celebrity! <3I may have read Tom's books out of order (I read The Good, The Bad and the Furry first) but it doesn't make them any less enjoyable, sort of like filling in the puzzle pieces. They're a nice insight to cat ownership when you have a dog. Loved it as I loved his first book Under the Paw. Tom is a very funny writer, made me chuckle throughout the book, fantastic sense of humour!! I like how he weaves his life into the stories about the cats and that its not all about the cats!! Although it is all about the cats!! Love this book. Love it, love it, love it. As a cat owner (2) You can fully relate to the sillyness you sometimes feel for cats, and also the conversations he has with them are only too true if cats could speak, I really didn't want this book to end, Thoroughly enjoyable.